2 DÍAS EN LINEA Y TENEMOS 250 PLAYERS REALES JUGANDO. 0 MULOS. Eres nuevo? te quedaste a tras? hay limite de reset semanal, ÚNETE YA! INAUGURAMOS EL DÍA 28/2/19 RECIÉN SALIDO DEL HORNO. ÚNETE CON TUS AMIGOS. Silver Medal, Gold Medal, Blue Box, Pumpkin of Luck! 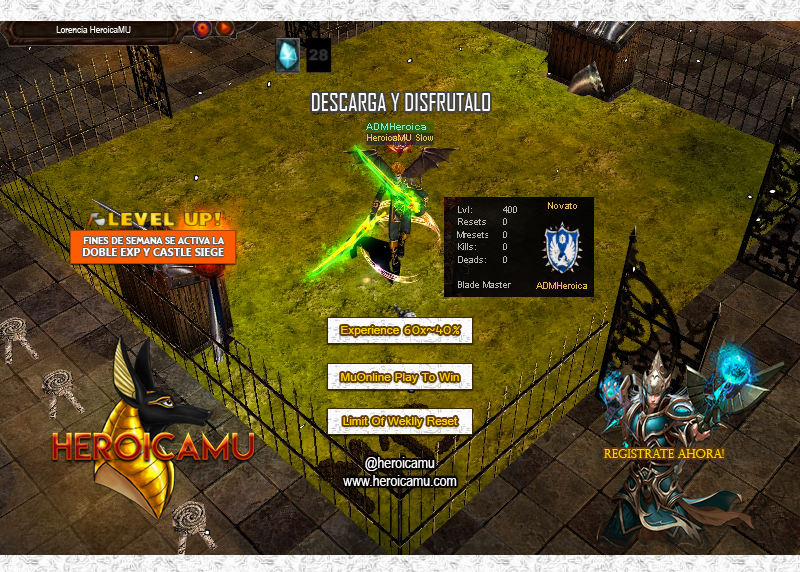 :: HeroicaMU :: 2 DÍAS EN LINEA Y TENEMOS 250 PLAYERS REALES JUGANDO. 0 MULOS. INFORMACIÓN ADICIONAL: LUCKY COINS: Exchange for items CHAOS CARDS: Exchange for items DROP EXCEL: 1/2 Options All Maps MAX SOCKET: 2 Free Slots WCOINS/GOBLINPOINT: Obtainable in game COMANDOS: /Offattack /Offstore /Offstore BOX'S DROP: Heart Of Love, Box of Heaven, Silver Medal, Gold Medal, Blue Box, Pumpkin of Luck!